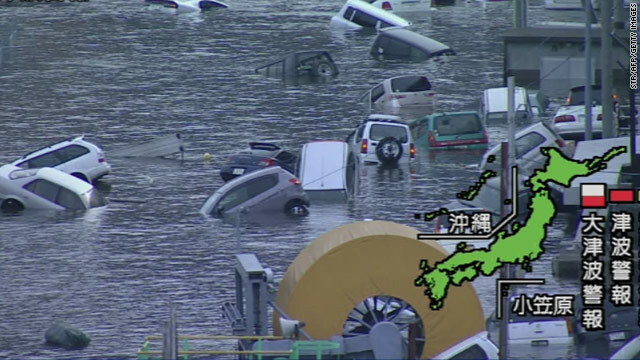 Tokyo (CNN) — The most powerful earthquake to hit Japan in at least 100 years unleashed walls of water that swept across rice fields, engulfing towns, dragging houses onto highways and tossing cars and boats like toys. Local media reported at least 32 deaths, with more casualties feared. And the 8.9-magnitude quake, which struck at 2:46 p.m., prompted the U.S. National Weather Service to issue a tsunami warning for at least 20 countries. 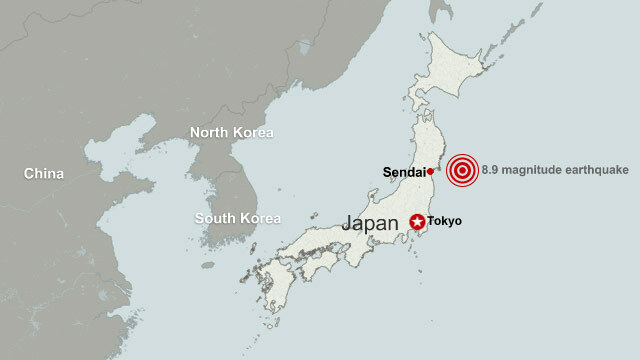 The quake’s epicenter was 373 kilometers (231 miles) away from Tokyo, the United States Geological Survey said. But residents there continued to feel aftershocks hours after the quake. More than 30 aftershocks followed, with the strongest measuring at 7.1. “I wasn’t scared when it started … but it just kept going and going,” said Michelle Gates, who lives in central Tokyo. A spokesman for the U.S. military bases in Japan said all service members were accounted for and there were no reports of damage to installations or ships. 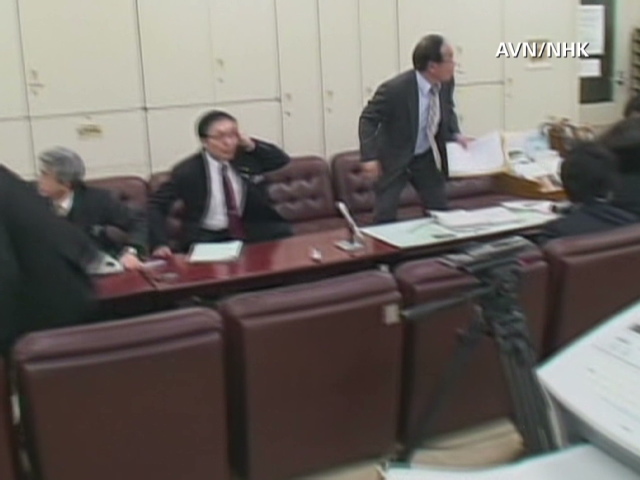 Japanese Prime Minister Naoto Kan appealed for calm and said there were no reported leaks of radioactive materials from power plants. Four nuclear power plants closest to the quake were safely shut down, the UN nuclear watchdog agency said. At Tokyo Station, one of Japan’s busiest subway stations, shaken commuters grabbed one another to stay steady as the ground shook. Dazed residents poured into the streets after offices and schools were closed. Children cried. 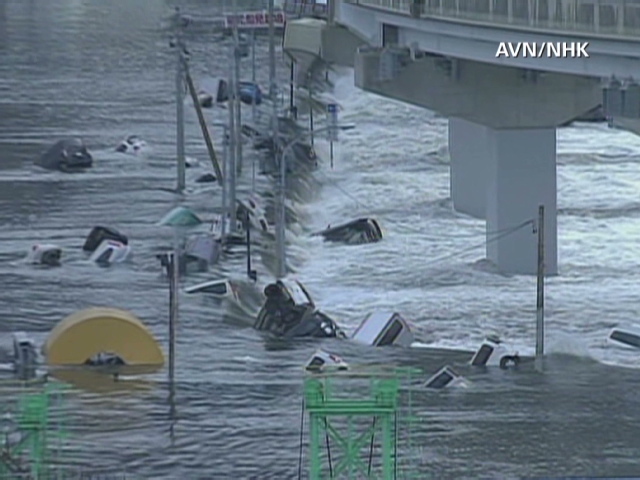 The quake toppled cars off bridges and into waters underneath. Waves of debris flowed like lava across farmland, pushing boats, houses and trailers. About 4 million homes had no power in Tokyo and surrounding areas. Firefighters battled a fiery blaze at an oil refinery in Chiba prefecture near Tokyo. Residents said though earthquakes are common in Japan, Friday’s stunned most people. “This was larger than anyone expected and went on longer than anyone expected,” said Matt Alt, who lives in Tokyo. Richard Lloyd Parry said he looked through a window and saw buildings shaking from side to side. “Central Tokyo is fine from what we see, people are calm … and not going inside buildings,” he said. Such a large earthquake at such a shallow depth creates a lot of energy, said Shenza Chen of the U.S. Geological Survey. As the city grappled with the devastation, a massive tsunami swept across the Pacific Ocean. An earthquake of that size can generate a dangerous tsunami to coasts outside the source region, the National Weather Service said. In Philippines alone, the tsunami is expected to hit in the early morning and the government has evacuated 20 provinces along the coast. Authorities in at least 20 countries and numerous Pacific islands issued tsunami warnings, the National Weather Service said. Humanitarian agencies were working with rescue crews to reach the people affected. “When such an earthquake impacts a developed country like Japan, our concern also turns to countries like the Philippines and Indonesia, which might not have the same resources,” said Rachel Wolff, a spokeswoman for World Vision. Wolff said her agency is helping people on the ground in Japan and teaming up to help others in countries along the path of the tsunami. Tsunamis are a series of long ocean waves that can last five to 15 minutes and cause extensive flooding in coastal areas. A succession of waves can hit — often the highest not being the first, said CNN meteorologist Ivan Cabrera. The quake was the latest in a series in the region this week. Early Thursday, an earthquake with a preliminary magnitude of 6.3 struck off the coast of Honshu. A day earlier, a 7.2-magnitude earthquake had struck off the same coast, the country’s meteorological agency said. The largest recorded quake took place in Chile on May 22, 1960, with a magnitude of 9.5, the USGS said.